CabinFever has been quietly making a name for themselves in Seattle for the last several years. With performances at the Fremont Abbey’s A Moving Conversation, On the Boards’ 12 Minutes Max, Velocity’s Big Bang, and an appearance at SeattleDances’ own Carnival among others, the group has established a witty and inventive presence. Co-founded by choreographer Elana Jacobs and dancer Emily Sferra, CabinFever emphasizes storytelling and personal interaction in an age witnessing a decline of both. Historically, their performances have incorporated a degree of whimsy, a dash of nostalgia, and a dose of the touchingly personal. Their greatest virtue, however, is how their slightly quirky sensibility always registers as genuine, never contrived. Their latest endeavor, Heart Content, which plays November 8, 10, 15 and 17, is sure to deliver more of the same, but this time in a highly unconventional setting. The performance will take place at the historic Stimson-Green Mansion on Capitol Hill, weaving in and out of the home’s rooms. SeattleDances had the opportunity to discuss Heart Content with director Elana Jacobs. Here’s what she had to say about CabinFever’s unique upcoming performance. SeattleDances: It’s been your goal to perform in a home for some time. What sparked this idea? What was the appeal of performing in this unconventional and intimate space? Elana Jacobs: Most of my past works on stages have incorporated furniture, room settings, and the concept of a home. I was trying to constantly bring the “home” in all of its various dimensions onstage. There is so much metaphor and symbolism that happens in a home. Making beds, morning breakfast, reading spots, nooks for intimate moments, back kitchen doors, the color of your favorite mug. All of these everyday symbols are doused with meaning so the home serves as another performer. A proscenium theatre and a black box theatre are like two very different characters that audiences meet when they walk in to see a show. The types of venues evoke totally different energies to an evening. In turn, I love the possibilities that a home can bring energetically to an audience. The mind can create many stories by just walking into a home without performers or words. The idea of CabinFever is to thrive from and highlight the stories, but not in a literal reenactment manner. Rather, we seek to proudly, elegantly, and in our own way, add another type of thrill to what is already there. This idea for a full-fledged house show in a home has been in the works for over three years and this performance at Stimson-Green is the culmination and fullest version of that dream. SD: What kind of stories of the house have informed the performance there and how have you mined this information about the home’s history? EJ: In collaborating with the Stimson-Green Mansion, I was drawn in by the relatable familial stories, the quirky tales about the architect, and the ornate design of the house. However, these initial thrills and visual aspects were just an external entry point that initially attracted my attention. What I found after interviewing the steward of the home, rehearsing in the space with the performers, and spending six months accumulating facts about the home, was something else at another dimension. I noticed the paradox in everything. This home is historic, pristine, untouched and restored, standing tall and proud on a more modern street. Almost like in Tuck Everlasting, watching the times change around them, the Stimson-Green Mansion has remained the same throughout all the changes Minor Avenue has seen since 1901. SD: What inspired the title for Heart Content, and how has this idea affected the piece? EJ: The Stimson Family [gained] most of their wealth from lumber and the “heart content” is the part of the tree in the center where the sap hardens and then expands over time. The larger the heart content, the better the building wood. I used this as a metaphor for many different aspects of this project. I thought about the trees watching over the lives that lived in the space over time in the wooden structure of the home. We also created installations for the rooms about our inner lives as people. Our performances play with the idea that, as we continue to experience and process this unfolding, we expand our peripheral vision of our life and build upon our experiences. SD: What’s been the largest challenge about creating this work? EJ: Sometimes it was a challenge to connect to the space. It is a beautiful and elaborate home, but because nobody is currently living there, bringing life into the space through ideas and performers took imagination and trust in our gut. SD: This show is the product of quite a few collaborations with musicians, singers, and designers. Tell us a little bit about your collaborators and how you’ve put all these elements together. EJ: We have six talented artists who specialize in improvisational circle singing. 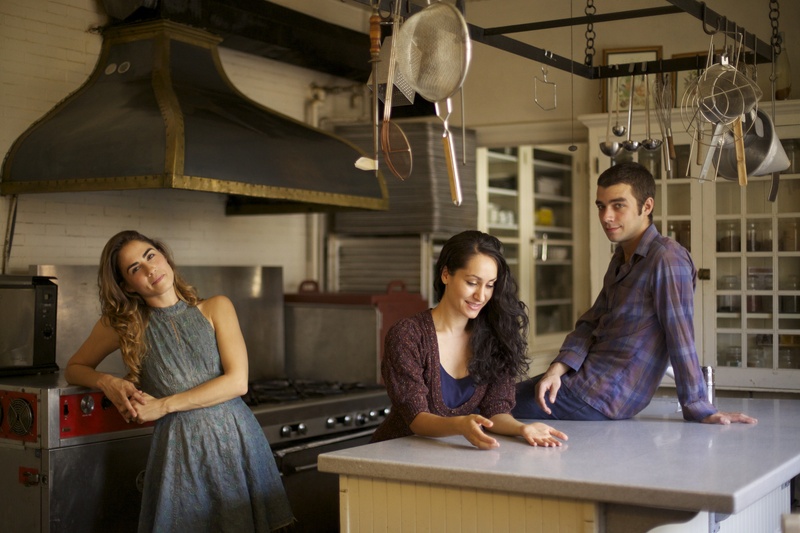 Three beautiful dancers, Emily Sferra, Sarah Lustbader, and Dylan Ward are seamlessly incorporating voice, movement and theatre into the performance. We have four extremely versatile local musicians and singers, Anna Goren, Doug Barber, Rebekka Goldsmith, and Mike Rimoin. We are thrilled that Erik Andor is our costume designer, Evan Anderson is our lighting designer, Ryan Smith is our visual artist for our programs and Justin Huguet does our graphic design. I feel extremely lucky to be surrounded by such talented professionals, all of whom have trusted the ideas and choreography through a long, six month process. Heart Content runs at the Stimson-Green Mansion on Fridays, November 8 and 15, at 7:30 PM, and Sundays, November 10 and 17, at 4:30 PM. Tickets for Heart Content can be purchased here. More information about CabinFever is available at their website.